Photos copyright www.clickchubut.com.ar - Text © 1992, 1996 Chris I. Lizza. All Rights Reserved. In spite of good, consistent skiing, La Hoya has been known as a regional center attracting skiers from Rawson, Comodoro Rivadavia, and other Patagonian cities. Anyone from the north skis at Bariloche because it is a bigger resort with easier access. Two factors are easing La Hoya's isolation. The first is the completion of a direct, paved route between Bariloche and Esquel. The other is the Arturo DeBernardi who is working hard with local public entities to open the skiable terrain of the La Hoya basin. La Hoya saw its first new lift in over a decade when a Poma surface tow was installed high on the west side of the basin. This lift, which greatly eases access to the entire rim, was running for the 1992 season. This summer, that lift is due to be converted to a T-Bar. A new chairlift is also slated for 1996. It will run from the cafeteria to a point just above the bottom of the converted T-Bar. Another chairlift is planned for 1997 to run from the top of this chairlift south to the back of the basin. When complete, La Hoya will offer the best expert skiing, and the latest season, in the Lakes Region of Chile and Argentina. I'll be back! La Hoya is positioned in the middle of the Cordón de Esquel which reaches 2,093m (6,867ft) at its highest point. The north-south range is about 70km (43 miles) east of the main Cordillera and the border with Chile. About 30% of the available skiing terrain is now serviced by lifts. 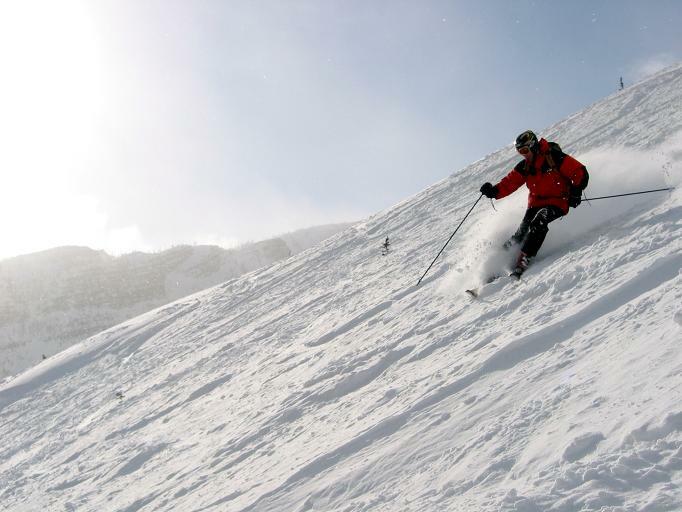 The ski area is divided into La Hoya Inferior (all the terrain below the top of the "T-Chair"), and La Hoya Superior. In spite of its low elevation, La Hoya has a long season because a warm sun never hits the south-facing slopes. The bottom chairlift runs alongside a creek that drains the basin in a deep valley much like Venus at Las Leñas. Treeline is reached just before the top of this lift, and the trail is skiable about half of the season. 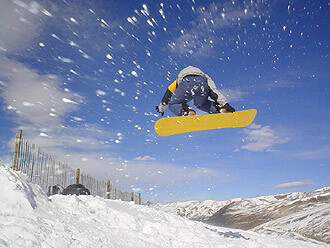 Snow conditions are often icy on the south-facing main runs but can soften into corn in the spring afternoons. Beginner skiers practice on the tow lifts in front of the mid-station cafeteria. Intermediates prefer the two variations of the run on the right of the upper Plateau pomalift. Advanced skiers can find four excellent bowls to the left of the T-Chair. The bowl closest to the lift is the most popular and is often heavily mogulled. 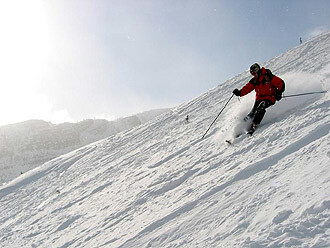 Expert skiers will find some steep - if somewhat narrow and rocky - chutes on the right side of the T-Chair. The new lifts described above also offer great advanced and expert terrain. Until the new chairlift is completed, access the new T-Bar by making a long traverse west from the Plateau pomalift. What really makes La Hoya special is the vast amount of expert terrain within easy reach of the ski lifts. The easiest and best is the snow-filled bowl above the Escuela run. The corniced ridge is reached with a simple traverse west from the top of the new T-Bar. Hard chutes empty into the bowl on its left side, while the right side softens earlier than expected due to its more northerly orientation. After a few runs in this area, skiers will want to continue past this bowl to reach the top of the long chute system that ends at the midpoint of the lower double chairlift (Aerosilla del Bosque). Scout a route on the first ride in the morning by looking left and up. Any other ridge in the cirque can be reached with no more than an hour of moderate hiking. Safe ridge lines provide access to six major bowls all of which are clearly visible from the top of the Plateau pomalift. Avalanche danger is minimized by the lack of major storms; weakened cornices and unstable spring snowpacks provide the biggest hazards. A week could be easily passed enjoying hikes to the off-piste terrain of La Hoya. Nordic skiers will find little appropriate terrain at La Hoya. Cross-country enthusiasts should instead seek snow in the Los Alerces National Park, famous for big lakes and tall trees, and deserted in the winter season.